Here is where you can get an idea about the kinds of companies that we help with their marketing projects. One of the interesting things about being in this business is that I get to work with a large variety of businesses and institutions. What they all share in common is a need to communicate with their market, whether their market be educators, parents, philanthropists, or in the case of our our first client to be profiled... decorators of store windows! 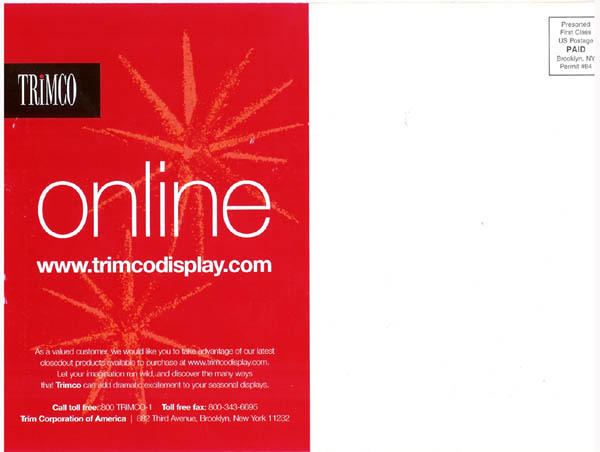 Trimco is a 45 year-old Brooklyn company not far from my office that sells materials to make store displays. They sell to stores in malls and downtowns all over the country and in Canada. While they do a lot of business Christmas time as that's when stores go hog wild decorating their front windows - there are lots of other holidays and seasons which means that we're mailing postcards and catalogs all year-round, either around shows that they attend or to promote their website or catalogs to spur stock sales. They also sell the stuff you don't think about, like mannequins and table cloths and crates and snowflakes and fake flowers - they are well known in their business and we love working with Hope, who sends us the mailing lists by email and their driver drops off the printed materials right to our Court Street door for us to mail. I will say this - 10,000 of their thick catalogues takes a while to unload and fills half our place! Their customers include Sears, Tiffany's, Kohl's, Saks, May Company, Verizon, Bombay Co., K-swiss, Russell Athletic. We're proud to be their mailing house.